I've been amazed by the large number of high quality coffee shops in Thailand. First Bangkok completely blew my mind and made me drink enough coffee to last a lifetime, now Chiang Mai has me feeling dizzy with its wide choice of creative coffee shops. I can't help but continue my quest to try them all and feature the best ones here, so you don't have to overdose! If you care as much about design as you care about quality coffee, then check out my article about best-designed specialty coffee shops of Chiang Mai. While Thailand is not exactly known for coffee compared to big exporting countries such as Brazil or Vietnam, it has its fair share of specialty coffee farms in the Northern provinces which produce balanced coffees mostly cupping between 85 and 89 points, with a few outstanding ones cupping above 90 points. I wrote an article about Thailand’s progress in producing specialty coffee for those of you who’d like to know more. What makes Chiang Mai a particularly interesting location for coffee enthusiasts is the fact that the actual farms are located just a few hours drive from the city and are hence easily accessible. All coffee shops I visited proudly brew and some roast Thai beans and occasionally invite a prominent guest country into a blend. If I would make a home for myself at some point, I would like it to look a lot like Graph Café. It embraces you with soft colours and vintage interior, plays the right soundtrack to put you in a coffee coma and feeds you home-made cookies. At least this is what happened to me. It is a tiny space fitting something like ten people. The smaller the better for me, as I love an intimate atmosphere that makes you feel part of something. A communal table encourages to socialize with those around you and the occasional sounds of coffee grinding and steaming milk remind you that you are not yet in heaven. I don’t want to leave! Can I move in please? I promise to drink a minimum of 20 cups a day! No chance, but I might camp outside tomorrow morning to be the first one to get in. 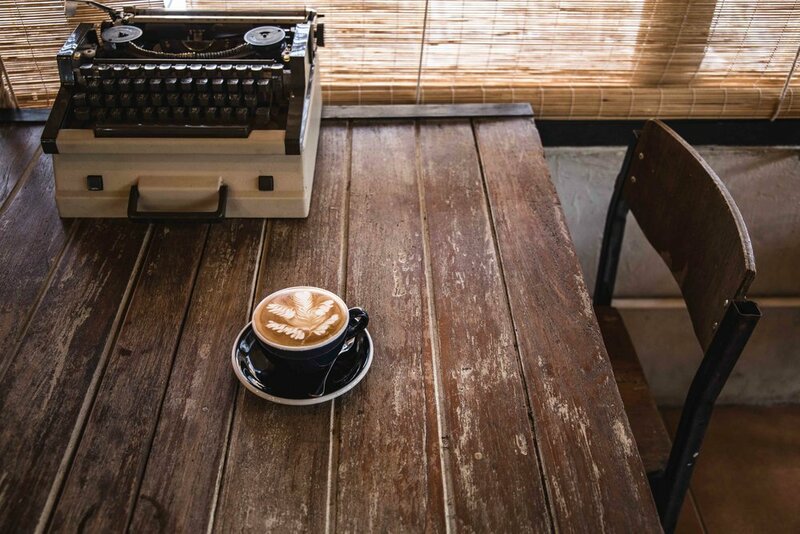 Graph Café is enchanting coffee lovers of Chiang Mai since 2014. Over the years they've specialized in cold brew and signature drinks. In 2015 a second location opened up just around the corner called Graph Table with a particular focus on quality dishes with a local twist. The latest edition to the Graph family was the opening of a coffee shop in the concept shopping complex One Nimman. Khagee is Thai for green, which is exactly how this coffee shop feels - like a breeze of fresh air in the forest on a hot summer day. Miki from Japan and her husband Thames opened this café/bakery by the banks of Ping River just east of old town Chiang Mai. It is nestled into the ground floor of a historic two-story building and sets a tranquil mood with minimalist interior design and soft, foresty colours. Their signature is great coffee coupled with freshly baked goods, such as carrot cake, bagels and melon buns. Coffee enthusiasts will be excited to find a La Marzocco Strada pulling the shots here. All coffee is roasted by FIEOW Coffee Room. 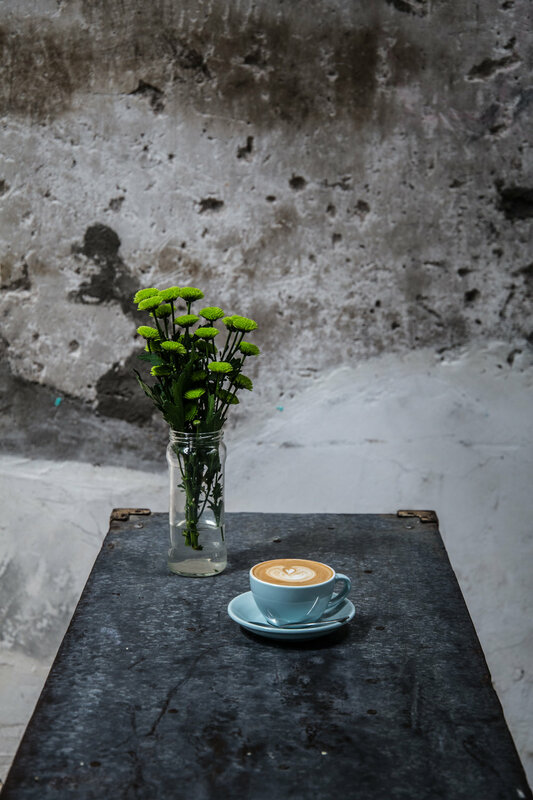 Set in a rustic old building a few steps away from Tha Phae Gate, Gateway serves excellent specialty coffee and signature drinks. I felt an all too familiar coziness when climbing the steps to the second floor café and soon found out why that was. This coffee project is operating under the Graph umbrella and shares some of the unique vintage features I had already fallen in love with at Graph Cafe. There is a nice selection of beans available at Gateway, including the cold wood’ house blend, a Thai single origin from Doi Chiang and a Thai single origin from Huay Chomphon. However interesting these sounded, I was too intrigued by their signature drink ‘Apollo’. It is a cold brew stirred with strawberry, honey lime and lemon. And because I can never resist anything baked with green tea, I also opted for the matcha-cheesecake with white chocolate. It was a match made in heaven. Ristr8to has professionalism written all over it. With its two locations in Nimman district (short for Nimmanhaemin road and surroundings) it has long become a tourist attraction and the number one spot for specialty coffee in Chiang Mai. Head barista and owner Arnon Thitiprasert gained experience in the coffee industry for 4 years in Australia before opening up Ristr8to in 2011. One year later the first beans were roasted in the back of the cafe, in 2013 and 2014 Ristr8to continued to perfect their brewing techniques, went on to win national latte art championships and started competing internationally too. In 2017, Arnon won the world latte art championship in Budapest. 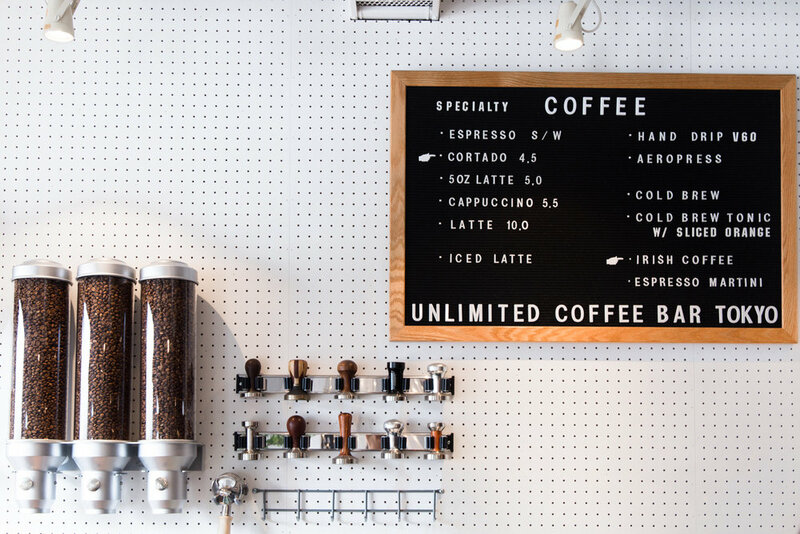 The unique cult concept café spoils coffee lovers with endless options and own creations, such as the Ficardie invented in 2012 or the Cigar8to invented in 2013. The menu is plentiful, informative and leaves no coffee craving unfulfilled. If you don't know a drink by name the description will tell you every detail of its preparation. All coffee served is graded "specialty" and single origins are available from across the globe for drip coffee. Espresso based options can be prepared with their own blend of 40% Thai, 30% Mexican and 30% Colombian beans. A.B.C.D. 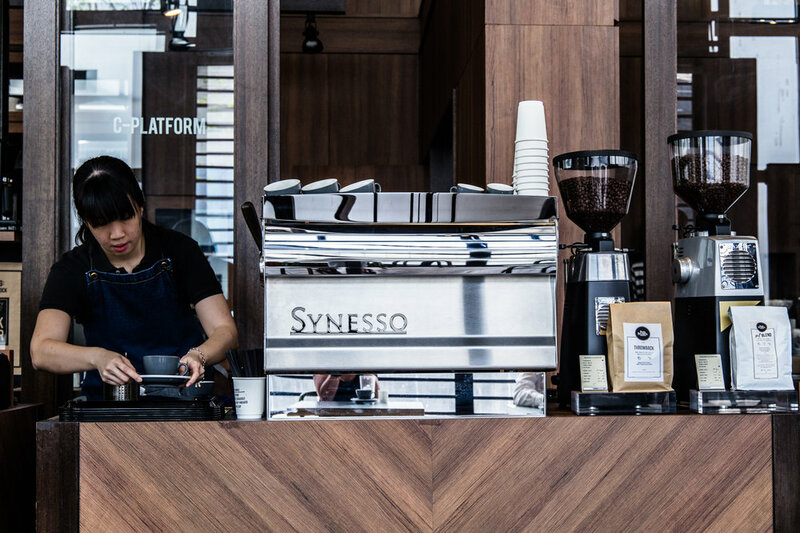 is a cafe brewing specialty coffee close to the popular Nimman neighbourhood that opened up late 2017. The owner Kwan is a graphic designer and made A.B.C.D. her creative playground. The coffee shop has specialized in signature drinks and petite baked goods. Barista Seagame was experimenting with Thai herbs while working on the newest coffee drink creation when I checked them out. The latest creation is called “Sphäre” and pays homage to Thailand’s favourite ingredient: coconut milk. The combination with iced coffee is to die for! All coffee beans are sourced from a local roastery and both espresso based drinks and cold brew are on the menu. Now Akha Ama Coffee is an interesting one. While at first sight it is a well designed, hip coffee shop close to tourist attractions in Chiang Mai, there is much more behind it than meets the eye. As the logo suggests, Akha Ama is a social enterprise that seeks to empower the local hill tribe community of the "Akha" living in Northern Thailand. The coffee collective that is Akha Ama represents more than 20 families from the Maejantai village, who joined forces to increase the social and economic return for their main source of income: farming. The founder of Akha Ama and face of the community is Lee Ayu, who launched the project in March 2010. His aim is to operate Akha Ama as a sustainable, fair trade, organic coffee brand that grows, processes and roasts high quality coffee. The brand is supported by no other than Stumptown from Portland and Lee Ayu travels back and forth between Thailand and the US to improve his skills and grow his business. I had tried Akha Ama coffee already in Bangkok, when the staff from Lazy Mary came back from Chiang Mai with a package of freshly roasted Ponlamai beans, which are incredibly fruity. While I did not have a chance to visit the original store in the Chiang Purh area, I did make it to the second branch in Rachadamnoen Road and had a fine cup of coffee of their full city roast. The compact ‘A Day in Chiang Mai Coffee Brew’ is located a bit outside of the old city walls but is well worth the extra mile. Wooden furniture, a brick wall and vintage items all mingle nicely to give this place a unique atmosphere. As signature drinks have become the norm in cafés all over Chiang Mai, you can expect to find innovative items on the menu here as well. The iced latte, for example, is prepared with five different kinds of milk from New Zealand, making it extremely creamy. The house blend used to prepare it comprises beans from Thailand, Costa Rica and Brazil to add citric as well as nutty flavours to it. If you feel overly caffeinated, try their ‘Autumn Day’, a refreshing signature drink with lemon and orange, guaranteed coffee-free.